Vloggers are making big money taking video selfies, teenagers are becoming millionaires because they started making selfie vlogs with specially designed flip screen cameras. Make your life easier by ensuring you have an articulated display. What is a Flip Screen Camera? We have all been there – you are at a concert surrounded by thousands of fans like you and you want to get a shot of the lead singer while he/she croons that beautiful lyric so that you can add it in your weekly vlog. Thankfully, a flip screen is an LCD / LED screen that solves the above problem. It is a retractable, articulating flip out display which flips up to show what you are looking at so you can just point and shoot. No post capture embarrassment, no tears. Ideal for taking pictures and recording videos from high and low angles, a rotation display camera is an adventure vlogger’s best friend. There is chaos, and you just cannot push your digital camera high enough, fearing it might get hurled into the crowd by those waving hands, trying to find your compact camera in a crowd is not cool. As for video quality, should be buying a 4k vlogging camera, they are not cheap, but getting there, there are affordable flip screen vlogging cameras on the market. These are just a handful of major issues that a flip screen camera helps in solving. The advantages are many and they will become apparent once you start using it. But, if you are one of those who is out looking for the perfect flip screen camera, we are here to help you. These are the primary areas that should be checked before making the purchase. If you are looking for a flip camera mostly for selfie purposes, then a front button is absolutely essential. While there are three types of cameras that vloggers generally use, we have made this list irrespective of them. Point and shoot, DSLR, and mirrorless – all three have their own special features and demerits, and aspiring vloggers should first choose from these flip up display cameras before narrowing down their selection based on the following reviews. In simple words, point and shoot cameras are small, compact and easy to use and do most of your job for you. As the name suggests, you just have to point and shoot. DSLR cameras or the majority of canon cameras, you can change the lens depending upon your shot (long, close up, selfie) and make plenty of other changes to give your photo or video that rich, dramatic look. Mirrorless cameras are similar to DSLRs but without the bulkiness. It’s a point and shoot camera with a changeable lens, but the low battery performance is always cited as an issue. In the following list of flip up cameras, we have tried to be as diverse as possible by selecting five models of five different brands. 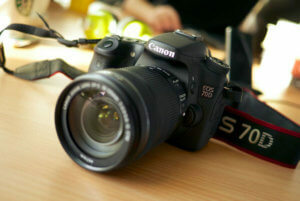 The best pocket camera of the group. 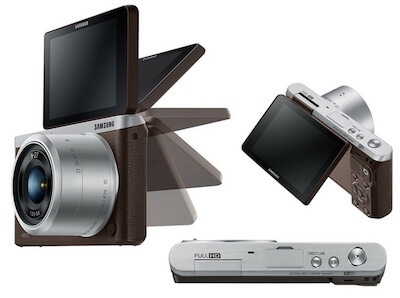 A lightweight mirrorless camera by Samsung, it may be small but it has a 3 inch touchscreen with a good resolution. The flip screen moves to the top of the camera so that you can see yourself while shooting selfie videos. The 20.5 megapixel CMOS sensor helps you capture high-quality images and videos, with 1080p HD support. Samsung vlog camera with flip display, with in-built Wifi and NFC you can instantly share your photos with friends and family or directly to YouTube if they don’t require editing, how awesome is that..! One of the defining features of the Samsung flip it is that it records video in H264 format, which is far better than MP4. The Samsung flip has a longer battery life compared to Canon, Panasonic, and Nikon which makes it the perfect portable companion for your next adventure vlog trip. 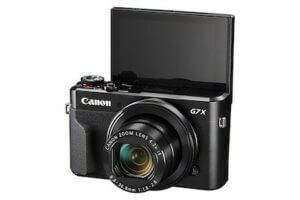 The best canon camera with flip screen – used by the likes of Casey Neistat, PewDiePie, and RomanAtwood, this point and shoot flip screen camera is considered not only the best point and shoot camera but the Best vlogging camera ever or the best canon selfie cam. As experts in this field, we only think that that is an understatement. There are so many features of the G7 X (Mark II and older versions) that we continue to recommend it, it is on another of our ‘Top Camera lists’ the Top 5 Best Vlogging cameras of 2017. 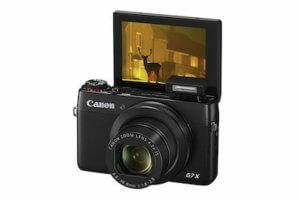 The G7 X Mark II has a 3-inch multi-angle LCD touchscreen which can be tilted up to 180 degrees up and 45 degrees down. The display resolution is better than that in Samsung NX Mini despite having a 20.2 megapixel CMOS sensor. Its low-light performance is fantastic compared to any other model, which makes it perfect for adventure vlogging. The canon Powershot sensor is highly regarded by the experts because it captures more light at the pixel level, giving you this flawless output for your YouTube followers. Superior quality images and videos even at higher ISOs, high-speed autofocus, 1080 60p HD recording, and inbuilt Wifi and NFC – it is often counted among the most compact point and shoot cameras for vlogging 2016. Feel free to start a canon vlog about how good they are. This Panasonic flip screen is similar to the Canon G7 X, except with a better display resolution. Slightly expensive when it comes to point and shoot cameras (considering the lens is not interchangeable), the DMC-LX10K is equipped with Sony’s White Magic technology which automatically improves the visibility of the screen by detecting the environment. The DMC-LX10K has a 20-megapixel sensor, inbuilt Wifi and NFC, and full HD 1080p support, which enables you to capture high-quality images and videos with ease. It is a 4K digital camera with a flip up display and the exposure control is great. This model, the DMC-LX10K and Canon’s G7 X are often compared with each other and most people then make their choice by based on the looks, which is really the only solution because both are up there with the best flip screen cameras. 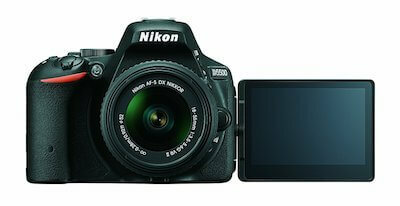 A DSLR flip out screen Nikon camera, the D5500 has a slightly larger articulated flip screen at 3.2 inches. It rotates and angles out adjacent to the camera, and the touchscreen makes it easier for you to trigger the focus. This Nikon Camera sports a 24.2 megapixel CMOS sensor with a wide ISO range, has 39 point autofocus and supports full HD video recording. You can hold the D5500 with complete control because it has a good grip, is compact, and is ergonomically designed. There are many other DSLR cameras out there which are better than the D5500, but only a few can challenge it when it comes to flip display and ease of use, and remember a Nikon flip screen DSLR camera is rare. 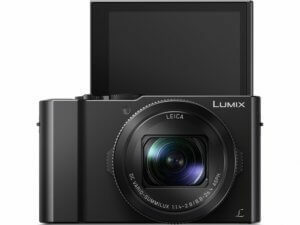 This is a double bonus; the best DSLR flip screen camera and the best Panasonic flip up screen, with features of Canon’s PowerShot G7 X, then the LUMIX is your best and cheapest bet. It has a 3 inch free angle flip touchscreen with 1.04 million dots. With an added microphone input, Panasonic flip screen has a 12 megapixel MOS sensor which can record videos in up to 4K resolution. The low light performance is dismal, but it makes up for it with face detection focus viewfinder, beautiful display, optical image stabilization, and manual exposure setting. Many users find the blurred background effect (found in G7 X) a huge demerit, but when you can shoot 4K videos at such a low price, who wants to complain? The low light performance is dismal, but it makes up for it with face detection focus viewfinder, beautiful display, optical image stabilization, and manual exposure setting. Many users find the blurred background effect (found in G7 X) a huge demerit, but when you can shoot 4K videos at such a low price, who wants to complain? Overall, the FZ300 is one of the best by Panasonic, gives you great features, a cheap 4k DSLR, so if you are looking for the best cheap vlogging camera with an articulated screen then this is the one for you. The top of the shopping list for us, a canon vlog camera with flip screen at a good price, check out our article with Antoine, watch the video to see the 70d in action using the 24mm lens, it is awesome! These were our picks for the top 5 flip screen cameras that will take your vlogging experience to the next level. Ease of use is the most important factor when it comes to rotational display cameras don’t underestimate how useful it is, thankfully all the above models offer that. If you are starting your Vlogging Career on a low budget, we have 2 flip screens on our cheap vlogging cameras under 200 dollars list. 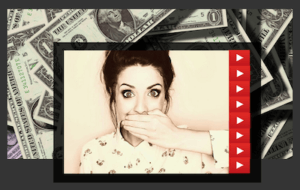 We hope that this list will help you make a wise purchase, whatever your budget, kick start your vlogging career, remember the smallest improvements are what separates you from the wannabe vloggers. Vlogging is like the guy she told you not to worry about. Today, it is not just a hobby, but a full-blown profession, now in 2017 it is capable of even helping you raise a family. And when it comes to being professional, you have to be and give your best. In vlogging, it means using the best gear, and to be more exact – using the right camera, articulated screen, viewfinder, external mic input, the lot! See what camera the top YouTubers use. Don’t go mad, there are affordable cameras that will give you everything you need, we’ll show you how to pick the best camera. Although there are a large variety of camera models, makes, and types manufactured by tens of consumer electronics brands, there are certain models which are tailored especially for vlogging purpose. 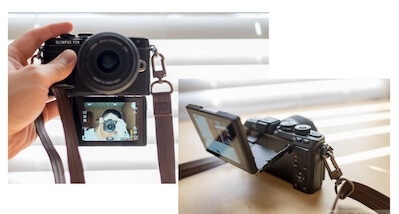 One of the most important and obvious features that the best vlogging camera will have is a flip screen, this has so many other names; the rotational screen, the front screen, swivel, articulating or retractable screen as it is technically known. It is basically a movable screen which helps you take better shots from odd angles and lets you see what your lens is pointing at while shooting. There are many other features related to it, but before that, Hope you enjoyed our picks of the top 5 flip screen cameras.